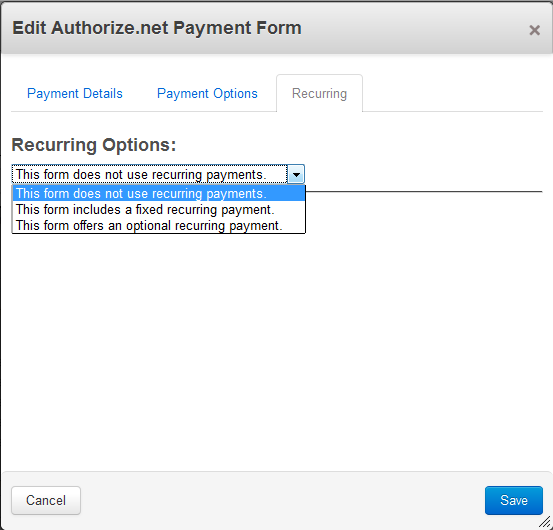 NOW INCLUDES RECURRING BILLING (ARB)! Please note: Versions 2.0 and 2.1 have been updated and tested with Concrete5 5.5 and 5.6 respectively. Note on upgrading: Upgrading from 1.0 to 1.9.2 caused an error because files inside the package folder were not being included in the upgrade. I did not hear back from C5 as to why that was. Please let me know if you experience the same issue upgrading to 2.x. 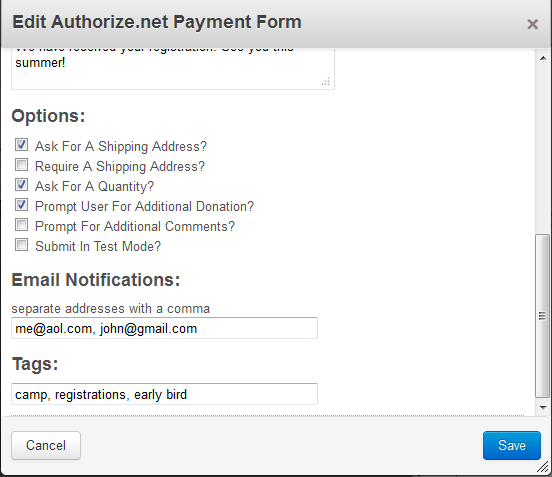 This add-on will allow you to easily add payment and donation forms to your website. 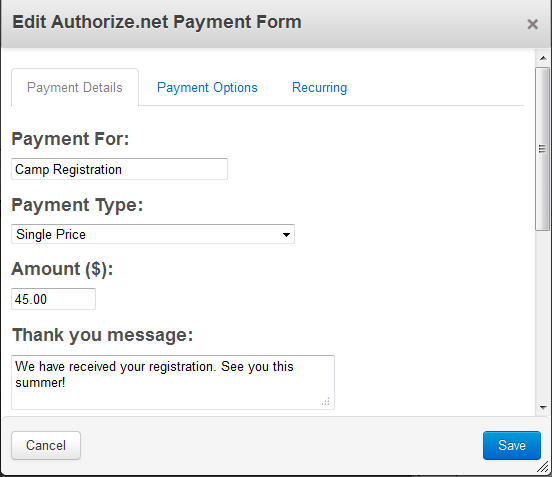 Each form processes payments through the Authorize.net payment gateway. Though the package is compact, there is robust functionality and reporting. Everyone pays the same amount. Example: sell a product that costs $25. Great for donation forms - allow the user to decide how much to pay. Enter payment options with different amounts and descriptions. The user can choose which option they prefer. Example, an event with different rates for a members and non-members. 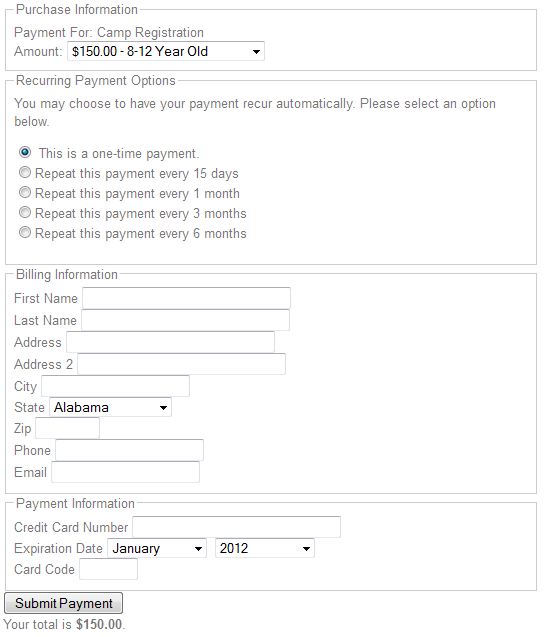 Provide 2 or more options for payer to choose from, indicating how often they would like their card to be charged. You can indicate that a recurring payment is required, or offer a one-time payment as well. 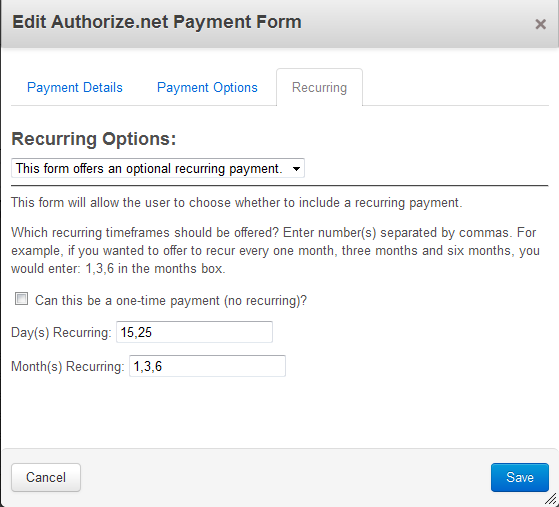 Fix the form for a given recurring (ARB) period, so everyone that submits a payment will be set up to the same recurring time automatically. An SSL certificate is required (we recommend the free Force SSL add-on). The form will not display if not called over SSL. The cURL extension must be available in your PHP instance in order to run this plugin. This is not a cart. Each purchase event can have multiple payment options and quantities, but is a single purchase for a single item. 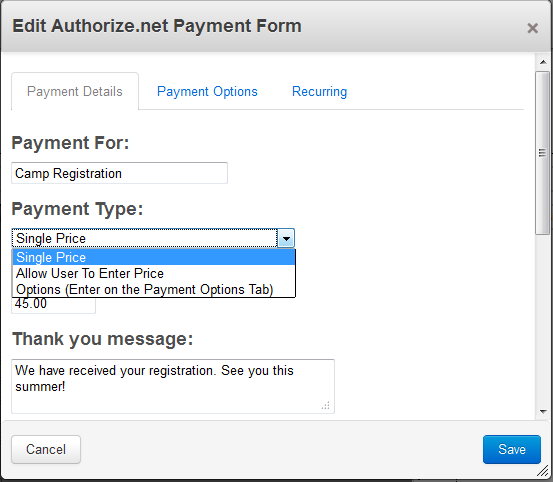 Interested in this functionality with another payment gateway? Let us know. With sufficient interest, we would be glad to customize this package to work with other gateways. Want this add-on for free? We are authorized resellers for Authorize.net. If you allow us to set up your account (at no charge), we will provide you a license for this add-on for free as well. To get started, just download the application on our website.